Take the fight to Sauron. What is it? An open world action game set in Peter Jackson's vision of Middle-earth. The orcs are the real stars of Shadow of War. Decorated with skulls, piercings, and plates of battered iron armour, these grotesque, toothy brutes sneer, jeer, and brag like rowdy drunks. And before you fight them they delight in detailing all the ways they’re going to kill you, gut you like a fish, and present your head to Sauron. It’s almost endearing how much they obviously love being orcs and serving their Dark Lord, which is more than can be said for the game’s dreary human characters—and that includes hero Talion, an undead Gondorian ranger with all the joie-de-vivre of a concrete bollard. The lauded nemesis system, first introduced in Shadow of Mordor, is back and expanded. So if an orc captain or warchief kills you, they’ll gleefully taunt you about it next time they see you. And if you defeat them, but they manage to escape, they’ll remember and reassure you that this time you won’t be so lucky. Forging bitter feuds with these expressive, unique enemies is the heart of the game, and easily the best thing in it. They’re the only characters who seem to be having any fun in this cursed world, and the vast array of positive and negative traits they have make them infinitely interesting and entertaining to fight. The game’s fun, crunchy combat is in the Arkham mould, with timing-based counters and an ever-increasing pool of moves and powers that increase its complexity. But before you wade into combat it’s worth interrogating weak-minded orcs to discover intel about their superiors: things they’re scared of, weapons they’re weak against, and so on. There’s something gratifying about making a scarred, snarling orc called Lûga Skull-Cracker flee in terror because one of his underlings revealed he has a secret fear of morgai flies. Waging psychological war on orcs like this is often more fun than fighting them. But it’s not all about rivalries: you can make a few friends too. Thanks to the power of the ring crafted by surly elven wraith Celebrimbor in the first game, it’s possible to weaken orcs, bend them to your will, and recruit them as allies. The brilliantly named Az-Grels Mountain-Eater, a hulking great lump of ugly muscle wielding a six-foot club, was my personal bodyguard for a while. Summoning him in battle and watching him charge in with his enormous club swinging was hugely satisfying. You can also call upon a handful of Gondorian soldiers to fight by your side, but they’re ultimately little more than squishy, expendable orc fodder. I love the new tribes system, which dramatically increases the variety of the orcs you encounter—both visually and in how they behave in battle. Orcs belonging to the stealthy Dark Tribe are fond of ambushes and trickery. Machine Tribe orcs are clad in thick metal armour. And the Mystic Tribe uses dark magic and cursed weapons. There are more, but I’ll let you discover them for yourself. The important thing is that, because of this added variety, almost every orc you meet feels like a distinct, original character, which makes the friendships and rivalries you form with them seem somehow more personal. In Lord of the Rings: The Return of the King, Frodo, Sam, and Gollum briefly stop at Minas Morgul, home of the Witch-king of Angmar and the Nazgûl. In Shadow of War you get to visit this place before they claimed it as their fortress, back when it was the city of Minas Ithil in Gondor. The game ties into Peter Jackson’s films like this often, and in some clever ways, but equally has no qualms about hammering its own ideas into the established lore. Talion forms an uneasy alliance with the giant spider Shelob, who appears to him as a beautiful woman; a pouting goth Galadriel who slinks about in black silk speaking in riddles, but never once gets hopelessly stuck in a bathtub. It’s a shame about the story, where the writers have focused squarely on the mystical, doomy side of Lord of the Rings. People solemnly discussing Sauron’s growing power, lamenting the war ahead. But where’s the warmth? The heart? People love this series because it mixes its grand fantasy with humour, humanity. Legolas and Gimli’s unlikely friendship. Anything involving the hobbits. In comparison, Shadow of War is almost entirely self-serious and in love with its own sense of grandeur. Its only really funny character, an Aussie orc called Brûz the Chopper, is wasted as a walking tutorial. And Talion is one of the least likeable heroes I’ve ever encountered in a game. He's a morose charisma vacuum who spends most of the game bickering with the equally humourless Celebrimbor, his spectral tag team partner. The game tries to paint him as a stoic, heroic force for good who’d rather not be fighting this war at all. But then, on the battlefield, he gleefully pops heads and elaborately executes people, clearly loving every second of it. It’s telling that any of the game’s randomly-generated orcs has more personality than this bearded bore. A new character called Eltariel, an elf chosen by Galadriel to hunt the Nazgûl, would have made for a much more interesting protagonist. As the title suggests, war looms large in this sequel. When you arrive at Minas Ithil you find the streets filled with battle-hungry orcs, siege machines, and Gondorian soldiers defending their home. The sense of scale is impressive, and you can climb to the top of the immense tower that gives the city its name. Monolith has brilliantly captured the grand, epic feel of the films, but the world has a sludgy, muted look that, while appropriate for a place like Mordor, makes for some bleak, uninspiring environments. Núrnen is an exception, however, with its green forests offering a welcome burst of colour and vibrancy. Continuing the war theme, conquering enemy strongholds—or nemesis fortresses as the game describes them—is one of Shadow of War’s most elaborate new features. Once you’ve built an army using Celebrimbor’s ring and weakened the enemy’s defences through killing warchiefs and destroying monuments, you can attempt to capture the fortress for yourself. These battles are wonderfully chaotic and you can join the fray, making use of siege machines and helping your soldiers gain territory by capturing victory points. Capture them all and you get the chance to enter the fort and challenge its overlord. Shadow of War ran without any problems at ultra/1440p on my GTX1080/16GB RAM/Intel i5-6600K (overclocked to 4GHz) PC. It struggled in 4K, though, so you'll need a heftier GPU to enjoy it at that resolution. There's a setting called Large Page Mode that requires a Windows account with administrator access and allows the game to allocate faster memory to improve performance. After the siege you can promote one of your captains to be overlord. This grants you certain bonuses depending on which tribe he’s in, but you do have to invest in defences—and level up your captains—to maintain your control over the region. There’s fun to be had in conquering fortresses, but it does also feel a little like managing a small business. Shadow of War’s biggest problem is being overloaded with systems that don’t feel integrated into the game in an organic way. And it’s constantly screaming at you to do things, which makes it feel like a fantasy to-do list. "Purify the Haedir towers! Reveal Shelob's memories! Open the Ithildin doors! Collect the Gondorian artifacts!" They might sound exciting, but involve little more than finding a thing then interacting with it. There’s just too much going on. Too many menus, too much clutter on the screen, too many half-baked features. I would have preferred a smaller set of lean, refined systems to all this bloat. I had no interest in half the icons littering the map, and I found it difficult to get immersed in the story because of how unashamedly videogamey it all is. “Our greatest asset is stealth!” Celebrimbor says as he teaches me how to dominate orcs with the ring, which would sound insane if someone said it in the films or books. I never felt like I was in Middle-earth, and I rarely have trouble suspending my disbelief in games. Other new features include a fashionable tiered loot system, which sees you picking up armour, swords, daggers, and other gear from fallen warchiefs and captains. While this did tap into my collecting instinct and I was, at first, eager to see what loot would drop, I soon grew tired of endlessly finding near-identical items with only minor stat upgrades. This is one of many examples in Shadow of War that bigger is not always better, and if you removed it from the game completely it would barely feel any different. And Talion’s clothes and weapons reset back to their default look in cutscenes which is kinda annoying. But it all comes back to the orcs. They’re the reason I kept playing, even when I was losing interest in everything else. A motley, gruesome, ill-mannered crew of swines that are a constant joy to fight and befriend. And the increased variety and depth of the nemesis system makes for a much richer experience overall. I just wish the game wasn’t quite so overfed. A lot of developers think sequels need to be bigger and offer more to get people interested, but I’d prefer it if they were just better. 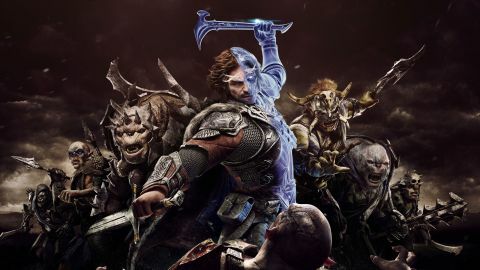 Shadow of War is a great action game that feels like it’s yearning to break free from a prison of open world busywork. Got questions about the game's loot boxes? Andy wrote a follow-up piece on them here.